Alan Male explains abstraction to be “borne out of a need to counteract the sabotaging of pictorial, figurative imagery by photography, painters engaged in a practice that bore no relation to nature or reality. They basically worked with colours and shapes of their own invention.” (Male.A 2007) Before starting my own illustration for this exercise I reacquainted myself with some of the abstract artists I particularly like the work of. I love how free Jackson Pollock’s work is. The gestural action in moving the paint around the canvas really conveys emotion. 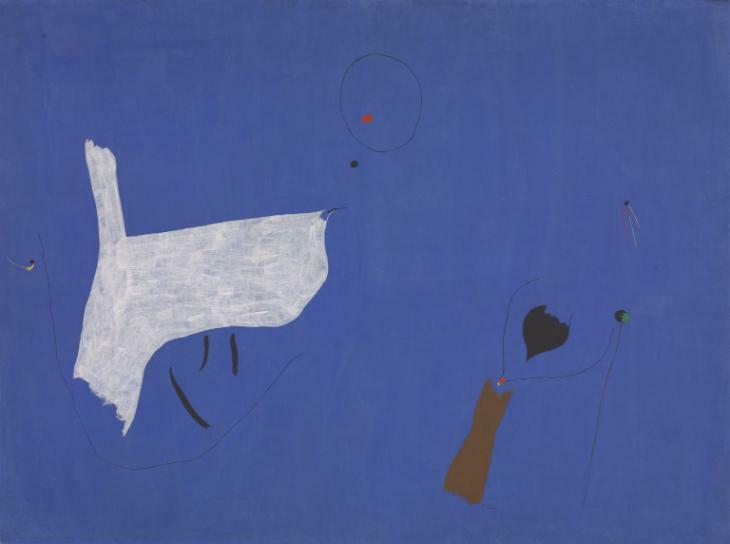 Joan Miro was part of the automatism movement which “was inspired by Freud’s idea of free association ( the desire to reveal the unconscious mind)”. (Tate) . This is my personal understanding of abstract art, it is a way to go beyond the ‘thinking’ mind to the subconscious. To allow feelings to express themselves without being censored or hindered. Kandinsky is another favourite of mine. The Tate describe him as seeing his “abstract paintings as an alternative pathway to spiritual reality”. (Tate) This really resonates with me because I think art, particularly abstract art is wonderful for rooting the artist in the present moment, making them a channel for consciousness and a higher power. I then searched for contemporary abstract artists. My favourites are shown below. Edvard Scott uses graphic textures, patterns and objects to create his artwork that has a real contemporary feel to it. 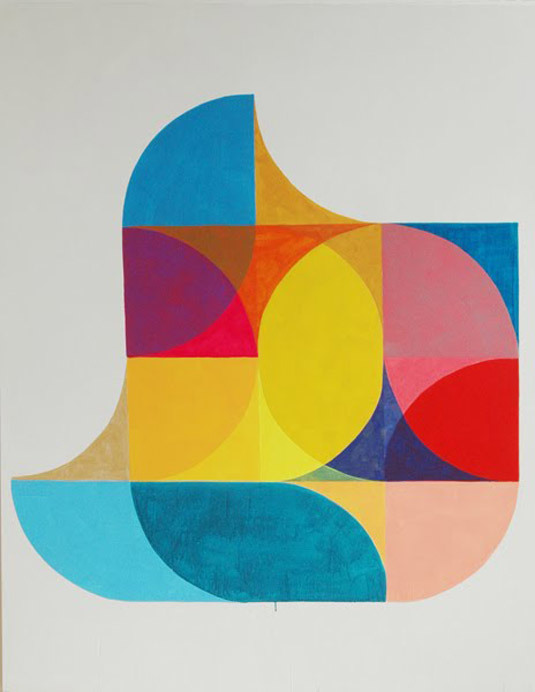 I am really drawn to the colour field painter Marta Marcé because she balances her use of colour and shape so well. Her work looks contemporary but it is probable she was influenced by the 20th Century colour field artists. 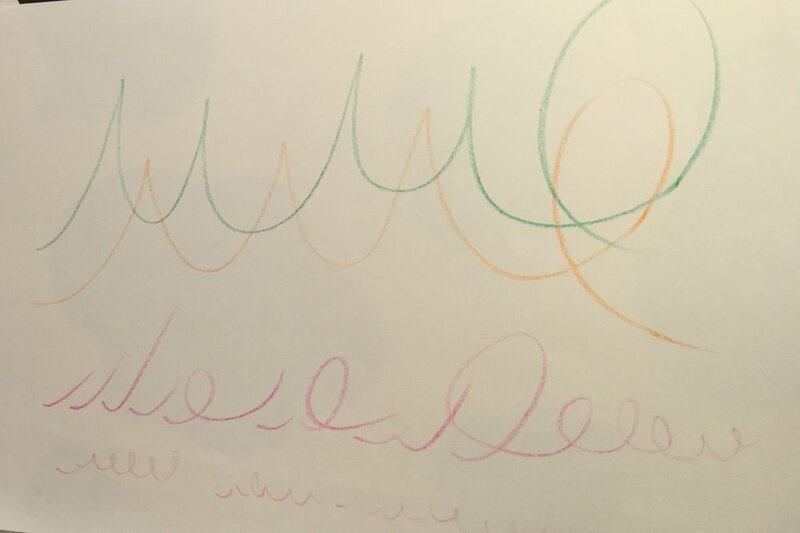 I used wax crayon to make my marks because they work well in quick expressive movements. I thought about using acrylic or gouache but think loading the brush etc would have broken the momentum up to much and taken me out of the moment. I named the two creations furthest to the right. The first is ‘Anticipation’ and the second is ‘Enlightenment’ which I chose to base my artwork on. I named it this because enlightenment is all about being free from mind which is exactly what I was while listening to the music. The shapes and colours I used are also linked with spirituality. The square area I selected to create an artwork from is shown below. 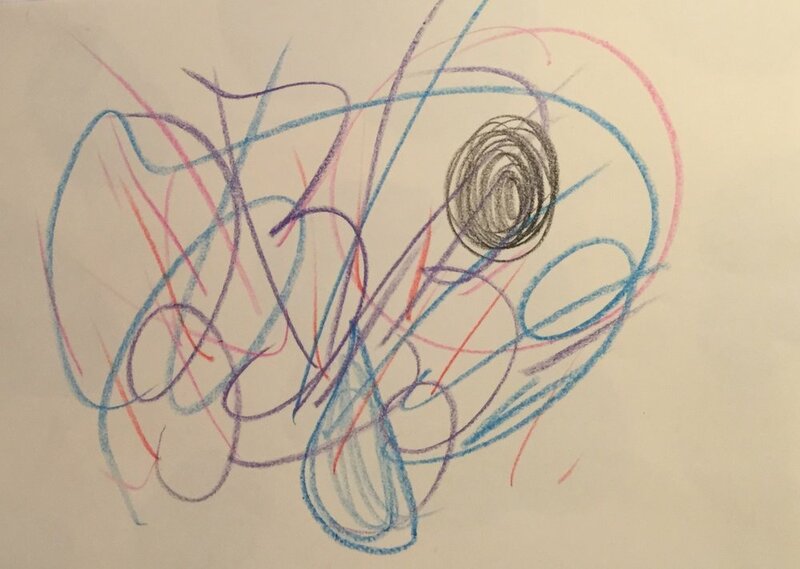 I chose the marks that most convey enlightenment to use in my artwork. The circular shapes forming an eye because people with high levels of spiritual perspicacity are said to have a third eye. The teardrop is a symbol of acceptance and waves are also an important spiritual symbol. I chose to use the spiral marks but adapted them to represent the journey to enlightenment; one that is not easy to take because the way gets increasingly narrower. Once I had chosen the basic elements I wanted to include, I tried out a few variations and compositions. I wanted to ensure there was a feeling of space in my abstract piece because spirituality and enlightenment is all about space. My next step was to make a rough colour visual. I used the colours from my original mark making. I don’t feel that the red worked. It is not a spiritual colour and seemed to be working against the essence of the piece rather than with it. My tutor has suggested that I become more familiar with digital programs and my use of bold shapes made this seem like the perfect opportunity to have a go at colouring in a scanned outline. I found the gradient tool particularly useful for creating the dreamy effect I wanted. Adjusting the opacity to make layers translucent also worked well in helping to convey the message. The colours work much better in this than those I used in the original visual. They are all spiritual colours. Over the course of this unit I have definitely challenged myself in terms of my use of digital programs. I have used them to edit, colour, assemble and add text. I still have a lot of learning to do in this area and will continue to develop my use of it, particularly for editing and in context of graphic design. 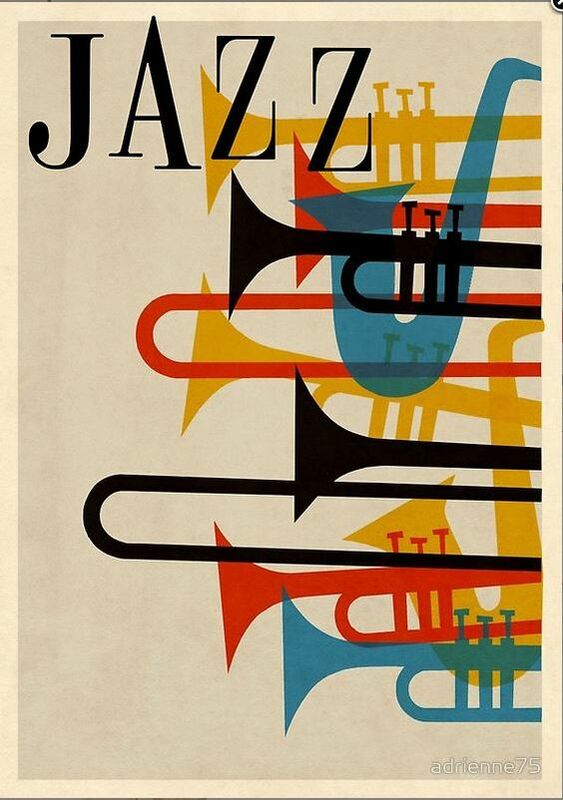 I am continuing to explore the potential of each brief, I found this difficult with the jazz poster, it was such a wonderfully wide brief I could have been exploring possibilities forever! I found that I had to choose a particular area and create a further mini brief on which to focus my work. I don’t feel like I have really started to find my style during this unit because I have stretched myself so much, exploring different styles and digital methods. I think the next unit offers more scope for developing my own style so I look forward to that. I also look forward to experimenting with other techniques such as cut paper, collage and printmaking. The brief for this assignment was to design an illustration for a poster for a music event. 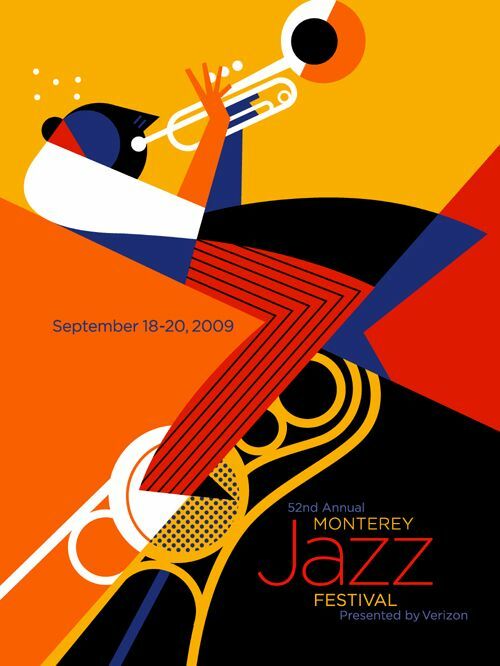 From the options given, I chose to create a poster for a jazz evening because of the striking visual imagery that came immediately to mind. 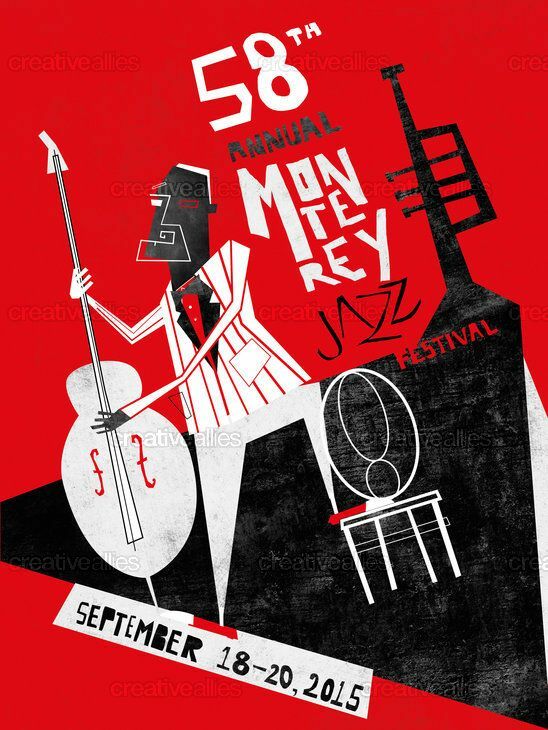 I then started researching jazz posters on Pinterest to get an idea and feel for content and aesthetic. Below are a few typical of those I found. All feature instruments, with some featuring people playing them. The illustration is quite graphic in style with bold line and colour. The typography is usually sans serif and non fussy. Some of the text used is quite quirky as shown in image 4 below. All four posters capture immediate attention through the striking artwork and colour choices. The two featuring the musicians have captivating movement in them while those featuring solely instruments seem more static. Apart from my original mind images of jazz and the images I saw while researching jazz posters, my knowledge of jazz was very limited so I started with mind mapping, written and visual. 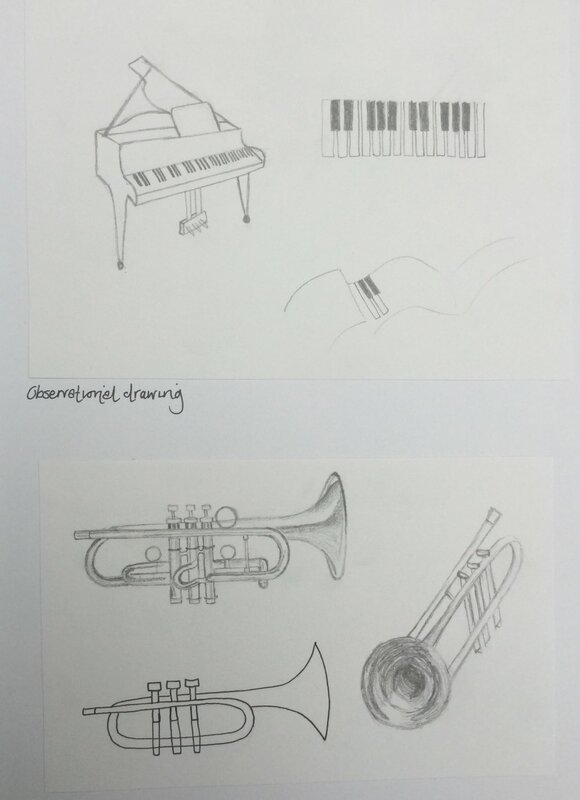 First, I drew instruments I associated with jazz and wrote down things and people connected with jazz that I knew. I then used internet searches to add to the written mind map and finally highlighted the words I wanted to use as a basis for my artwork. I also used this to create myself a mini brief for the type of jazz evening I was making a poster for. A twenties style jazz night in Chicago. I researched Chicago venues and thought the Houses of Blues fitted perfectly due to jazz having roots in blues. Next I made a collection of jazz images and posters on Pinterest connected with the words I had highlighted, then made a moodboard using the images that most portrayed the feel and ambience I wanted to create in my poster. 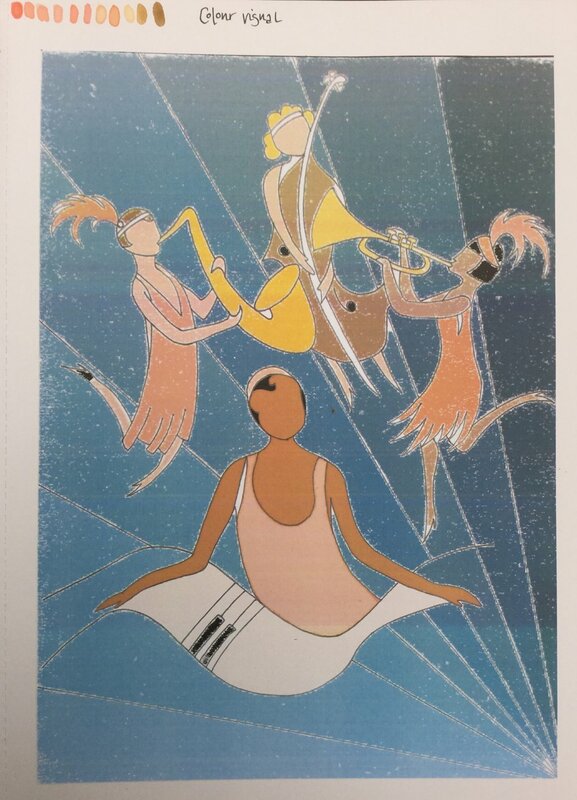 The images I selected to use were mostly from the twenties, art deco in design and included posters for music evenings and Vogue covers from that era. I love the elegance of the 1920s and this was a decade known as the jazz age so I thought it would make a beautiful aesthetic and illustration style for a poster. The images I chose also gave me the colour palette which I have shown further on the mood board through colour swatches. References for moodboard images: From top left: slashnology.com, rewindvintage.com, splashnology.com, nanlawsontumblr.com, reginacarter.com, charlestonchallengedownunder.com. While researching jazz musicians I found that most of the key figures were men and that most images that come up in searches depict men playing the instruments. Women sang, but they rarely played the instruments. This led me to search for women jazz musicians. There are quite a few contemporary ones so I added these to my mind map and moodboard. Visual images from the twenties heavily feature women due to the radical change in fashion the decade brought so it seemed fitting to have women musicians as a theme in my artwork. To me, jazz is freedom, it can be improvised. Likewise, the dance of the era, the Charleston, gave the dancer a sense of freedom that previous dances hadn’t. Both are full of energy and movement and this is what I wanted to portray in my poster. 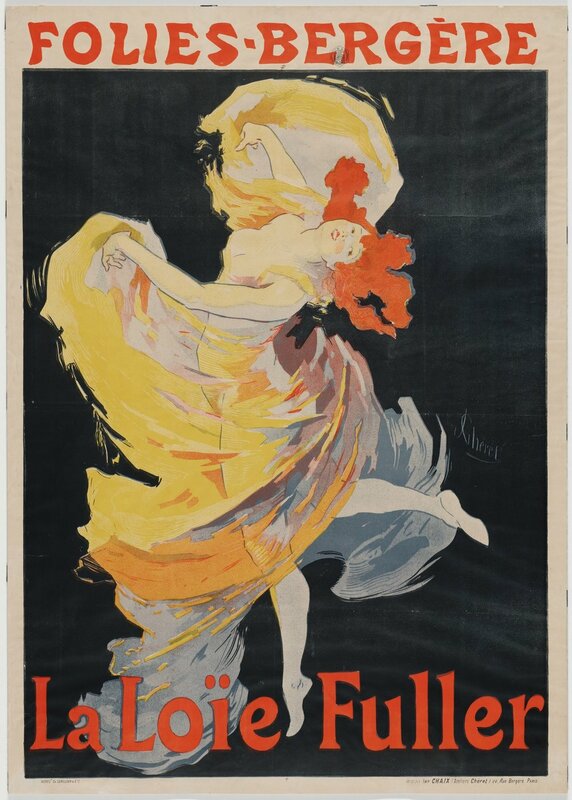 I am inspired by the work of Jules Chéret and in particular posters he created for dancer Loïe Fuller. They are so full of life and movement and imbue performance. 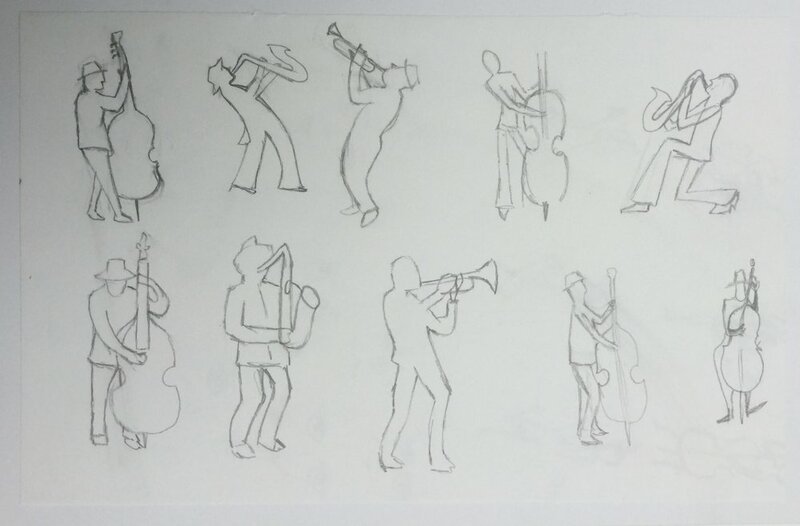 Before I started creating thumbnails, I drew some jazz poses from silhouette images to support with my figure drawing for the poster. I then turned some of these into female poses, trying to add more of a sense of movement. At this point I also drew some twenties figures from observation (glamourdaze.com). When creating my visuals I used an artist’s dummy to help get proportions right because I couldn’t find any images with the positions I wanted to portray. When creating my thumbnails, I referred back to previous exercises illustrating visual space and viewpoint to ensure I explored all options for composition. 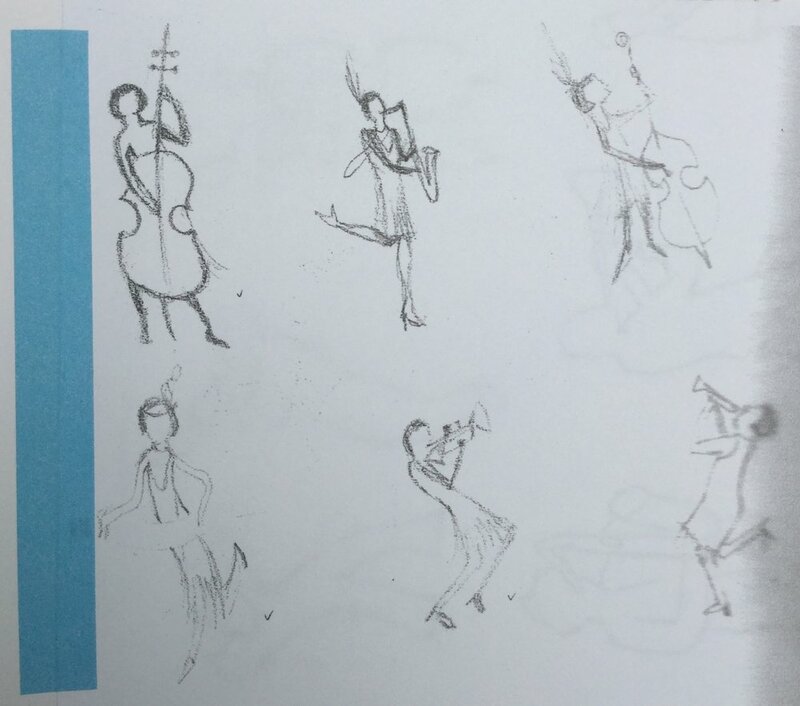 I explored changing the number, size and positioning of the musician figures. I tried whole figures and some that were more cropped, large figures in the foreground with smaller in the background, and some with more equal sizing. All thumbnails though show the content face on. I didn’t try out viewpoints from above or behind because I knew I wanted to engage the viewer of the poster by connecting them with faces. I also thought front and side views would create the most movement in the image. The thumbnails I thought were most successful in communicating my idea were the ones with larger figures taking up most of the frame. I chose two that were quite different to each other to produce visuals from. I felt that having the piano player at the front worked best out of the two because the wave of the piano created the sense of movement I wanted. I felt that the continuation of sway from the piano to double bass complimented this with the other two figures fitting each other in shape and movement too. The second visual didn’t have the movement and The cropped foreground figures in the second visual made the image seem rather stilted, like the movement had been stopped. Once I had chosen which visual to use, I created stronger line version to be scanned in order to make a colour visual in photoshop. The colours used were from my moodboard. My original intention was to use hand drawn text on my poster so I drew it onto tracing paper and explored laying it in different positions on a printed version in order to find the best one. If working for a client though, I realise I would need to include it on the actual visual so that necessary edits can be made before the final artwork is submitted.. I chose to make watercolour my prime media for the final artwork in keeping with the twenties art from the Vogue cover from my moodboard. However, in order to keep developing my use of photoshop, I decided to create the content and the background separately, then assemble it digitally. This proved very tricky though with the white background being very difficult to remove effectively. I tried many different methods after googling the issue but none of them worked well enough. This first attempt is shown below. There is a lot of white that hasn’t been removed and there isn’t a crisp line around the foreground content. This did give me the opportunity to further explore how the poster looks with text. I had created a second colour visual with text this time! For my second attempt, I went back to basics and did all the artwork on the one sheet of paper. The paper was scaled slightly down from A3 size. Starting again gave me the great opportunity of being able to make improvements and changes to the original. In my first version, I was trying to make my illustration a little more graphic in style, with colour in shapes rather than my usual more textural style. When completing it the second time, I stayed truer to myself and I felt so much more confident and enjoyed it much more. I feel that the face of the piano player is much improved and I prefer the piano without the black outlines. The text used in this is my hand written text, created after researching deco fonts and added in photoshop. I also made the same poster using a font I had previously purchased. This font however doesn’t include numbers so I had to use numbers from a different font. I had to try a number of these before I found one that fitted well! Having completed this assignment I wanted to refer back to the quote about successful posters earlier in this post to see whether my poster achieves its aims. I think my portrayal of women musicians in an Art Deco style creates enough interest to seize and hold brief attention. It is clear from the text and the artwork what message is being conveyed and the type of evening being advertised. The movement I have managed to incorporate adds life to the poster to engage and motivate the viewer, an important feature of posters for performance. I think the colour palette supports the poster in catching the eye. My use of light colours on a dark poster creates a contrast, with the eye being initially caught by the bright white of the piano. If I was to undertake this assignment again, I would explore adding more distortion into the figures and instruments. I have used a little stylisation but think there is scope for more. I learnt a lot about using watercolour on large areas while completing this and will continue to explore letting the medium’s ‘free will’ do some of the work for me. When starting this exercise I was reading ‘The Colour Purple’ by Alice Walker. It has quite a boring cover so I thought it would work well as a basis for making a mock up. The story is centred very strongly around three women and how they find solidarity through each other so I wanted to create an illustration of these women for the front cover. I googled the film of the same name so I could get some reference images for the appearances of these women. I found images of Oprah Winfrey as Sofia and Whoopi Goldberg as Celie and drew them from observation as a starting point on which to base my illustration. It was when I was looking for a photo of the character Shug Avery that I found an image that was perfect for my illustration. It includes the two main characters and clearly shows the tender relationship between them. It was also perfect because of the light on their faces. To challenge myself, and also to stay in keeping with the original book jacket design, I had decided to try and create a more graphic style illustration and thought the light in this image could really transfer well. I drew the image from observation, then made copies and used these to map out the lines I wanted to keep in my final illustration. I kept in mind the learning from the previous exercise in terms of editing out line. I just wanted to keep the lines that formed the main structure and those needed to show where the light falls. 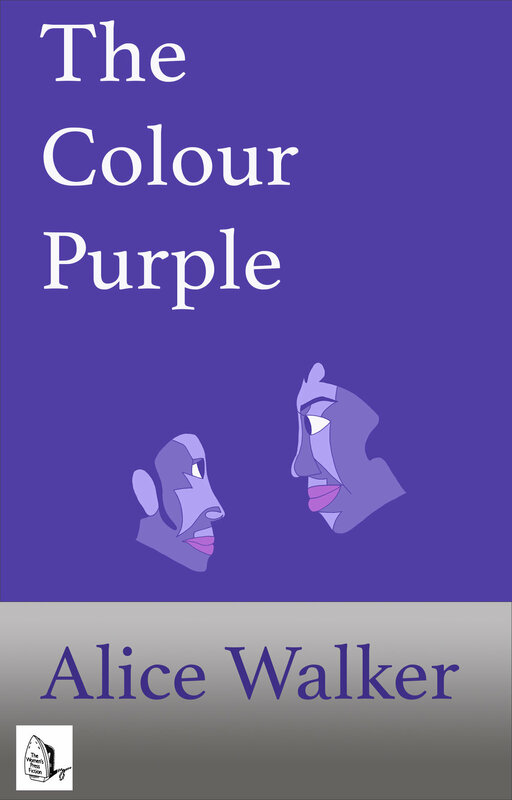 Not only is it the title of the book, but the colour purple is a hugely important theme in the book, representing Celie’s spiritual discovery. Therefore the final illustration needed to be in purple so I tried out different shades to work out how many I would need. 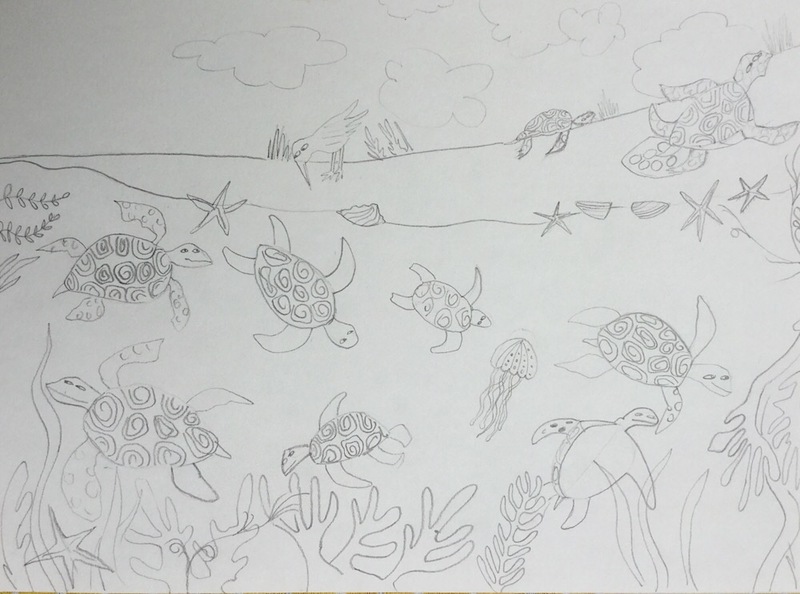 From there I scaled up the image to create line art to be scanned into photoshop for colouring. I made the head of Shug Avery slightly larger than than of Celie and placed it slightly higher. This is because Celie looks up to Shug and sees her an as idol. She is the one who guides Celie onto a new spiritual path. Pencil wasn’t clear enough to be able to select the outline in photoshop so I went over it in pen. I chose to use flat colour because that was the graphic look I was going for and tried out different shades of purple, finally settling on those in the illustration below. I think the shapes created by the light in the photo have transferred really well, especially in Shug. The lines used depict light and shadow and also highlight her bone structure. The white outline provides the negative space needed when looking at a lot of purple. In future work like this, I could experiment with thickness of line and explore adding highlights and shadow into the colouring. Pleased with my illustration for the book cover, I then started to make mock ups in photoshop. I looked through various different fonts, but chose one similar to the one used on the original cover. I also decided to use the same colours, purple, white and silver. The publisher’s logo is sourced from www.designweek.co.uk. These first three designs have the title, illustration and author’s name in the same position in the design. The only difference is the placing of the words in the text. Within this design, I think the text looks most effective in the centred position (shown in the third image). In my next two mock ups, I removed the white section completely. I don’t think the first of these is as successful as the previous ones because the illustration and author’s name are not clear enough. In the second, I changed the font colour to white to make the authors name stand out more which worked better but I think the illustration doesn’t pop enough on the silver background. The next three mock ups all have purple as the dominant colour with the illustration blending in to the background which I think looks effective. The author’s name can be read clearly in the silver. I tried text in different positions including vertical text which really didn’t work and was difficult to read. Having the text and illustration both placed centrally didn’t look right either. The design below is my chosen mock up. I think it conveys the themes in the book effectively and clearly shows the author and publisher information. Placing the text to the right with the illustration centrally means the design is balanced and the eye is led from left to centre finally resting on the author’s name. For this exercise we had to choose two illustrations, scale them up and edit them to create a clear visual of its main structural form. The first illustration I chose is by Elise Gravel from her book ‘The Mushroom Fan Club’. I chose this illustration because it contains a range of content and is composed of bold shapes. I wanted something that wasn’t too detailed for my first attempt at scaling up. This original measured 16.4cm by 22.9cm so when scaled by two and a half the visual needed to be 41 x 57.2cm. I didn’t have any ‘art’ paper larger than A3 so I used lining paper to produce my visuals instead. Although the illustration initially seemed that it would be quite simple to reproduce in a larger size, there were actually a lot of lines and angles that I needed to get just right. I did need to measure content in the original and multiply by 2.5 to ensure accuracy. Even so, I still didn’t have quite enough room at the bottom of this first version to fit the cat in properly. I found the house the hardest to reproduce and the girl easiest. Now I had my scaled up visual, I now needed to edit out as much of the content as possible while still making sense as an illustration. It was while doing this second version that I realised that the reason I ran out of room at the bottom of the first was because I had mis scaled the large bush in front of the house. The learning point here - to check and recheck the maths! The original image didn’t use many extra lines than were needed to make the image readable so there didn’t seem to be much to edit out. The lines I left out were all lines for detail, I kept all content. The second illustration I chose for this exercise was more detailed. I had practised large bold shapes so I wanted to have a go at something more finely illustrated. It is from The Big Book of the Blue by Yuval Zommer. 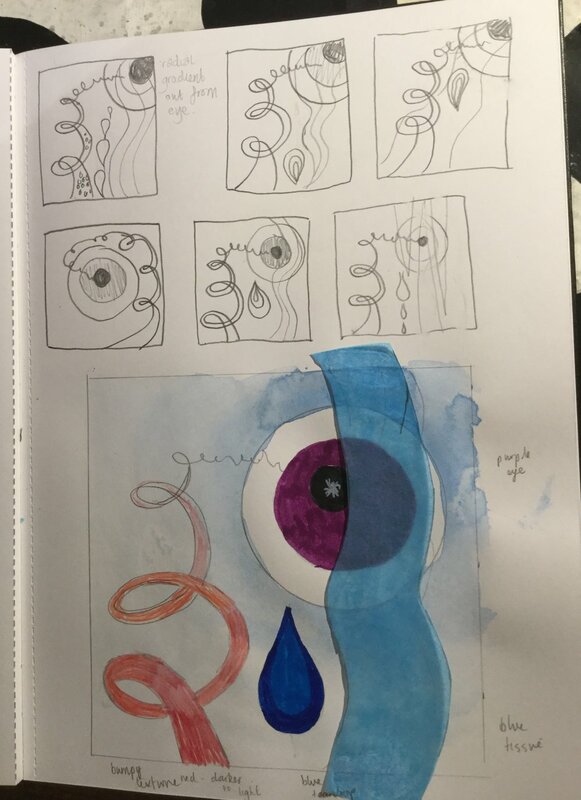 I also didn’t want to have to create anything quite so large and at the back of the book, there are thumbnail images of the larger images in the main part of the book. These measured at 8.3 x 6.1cm. I scaled up three times to work at the size of 24.9 x 18.3. I found that I didn’t need to measure content to scale up like I did with the first illustration. I was much more able to use my judgement on sizing and positioning. There is a lot of detail in the image and in my first visual I included what I thought was needed to make it descriptive. In the second, I removed all detail leaving just the basic outlines. This exercise has given given me the insight into edits that may be needed when presenting a client with visuals. I have also learnt lessons in the technical aspect of scaling an image. I think the textual information about sea turtles would have driven the art direction in this book. The client would have wanted the razor sharp edged jaws of a turtle shown in the visual because that will be described in the text. Likewise, the eggs on the beach need to be shown because that is also in the text. When looking at the image again with the text and thinking from this reverse point of view, I can see the edits a client would make. It has also made me realise that I had actually edited out these two important bits of information in this second visual. I this is because I was working from a thumbnail without considering the text. Once I took the text into account, I could see what needed to be included in the visual. Below shows an my third visual that includes this information and the original illustration with text. I chose the word summertime around which to make my collection of objects and made a mindmap to start the exercise. 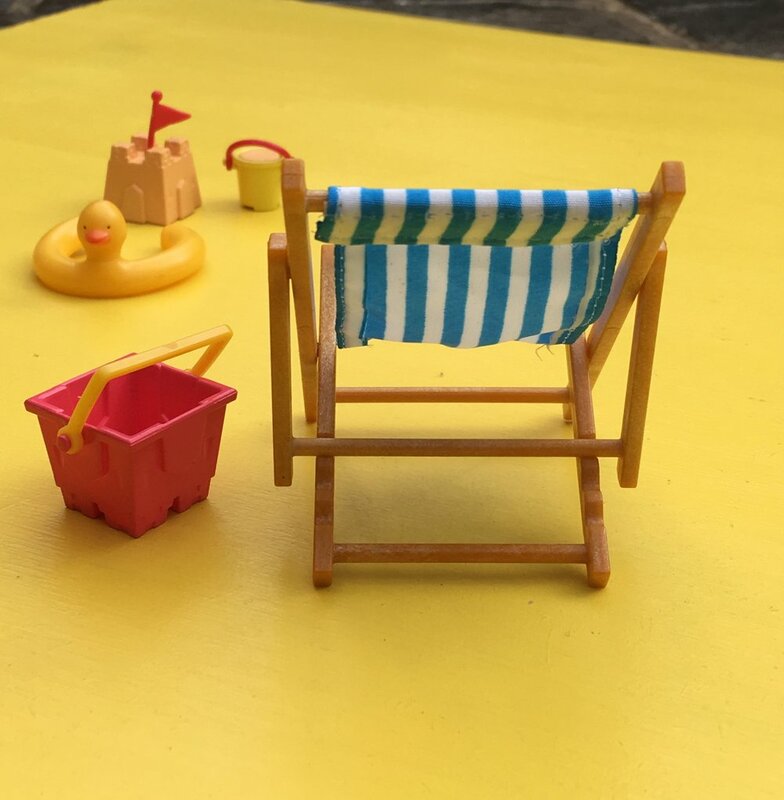 The beach and seaside theme was strong in my mind mapping so I chose to use items from a toy miniature beach scene. I arranged them together to make the scene and took photographs from different viewpoints. Once I had taken photographs from different angles, I then positioned the frame differently so only part of the deckchair is visible. 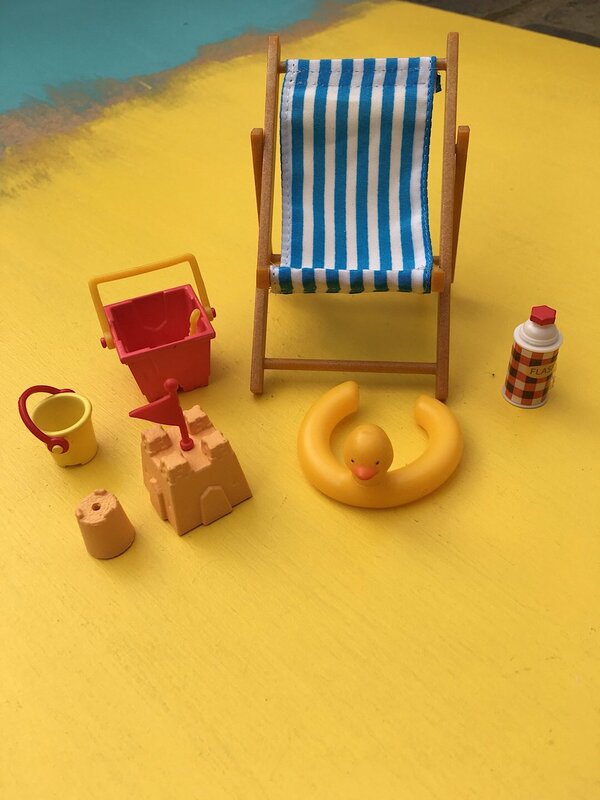 In the first photographs above, I didn’t think too carefully about where to place the objects but cropping out some of the deckchair made the arrangements of the other objects more important. I reduced the number of objects so prevent the image looking too cluttered. 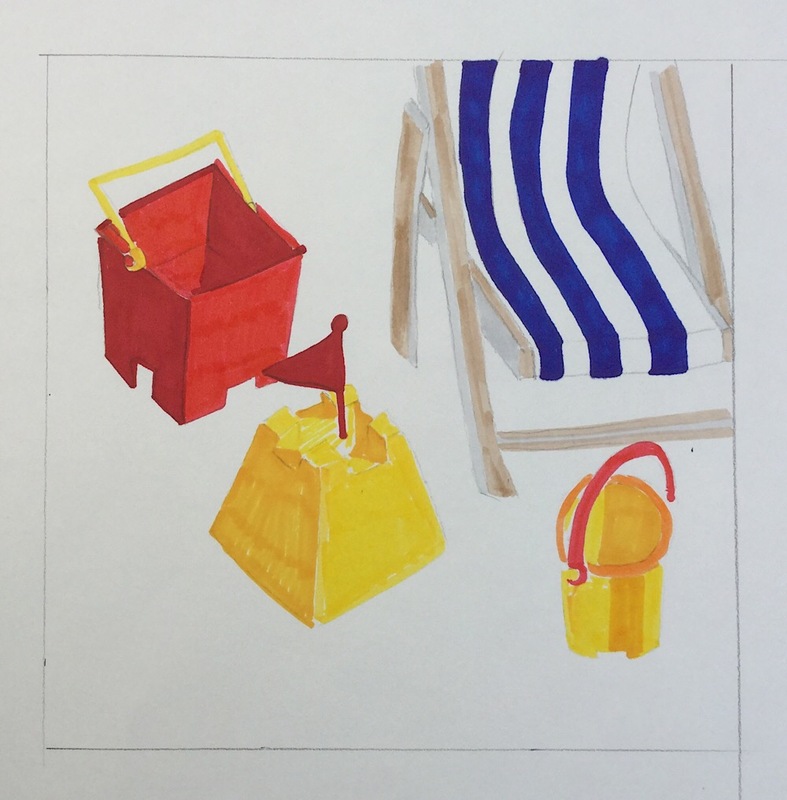 I placed the objects at differing angles to the lines of the deckchair to explore variation in shape. I think this is most successful in the first photo (top right). However, I also rather like the line of the flask running parallel to the lines of the deckchair in the 2nd photo. Perhaps I could have explored this further. Next I zoomed in on different items in the collection. I think this worked well in creating hierarchy in the image. 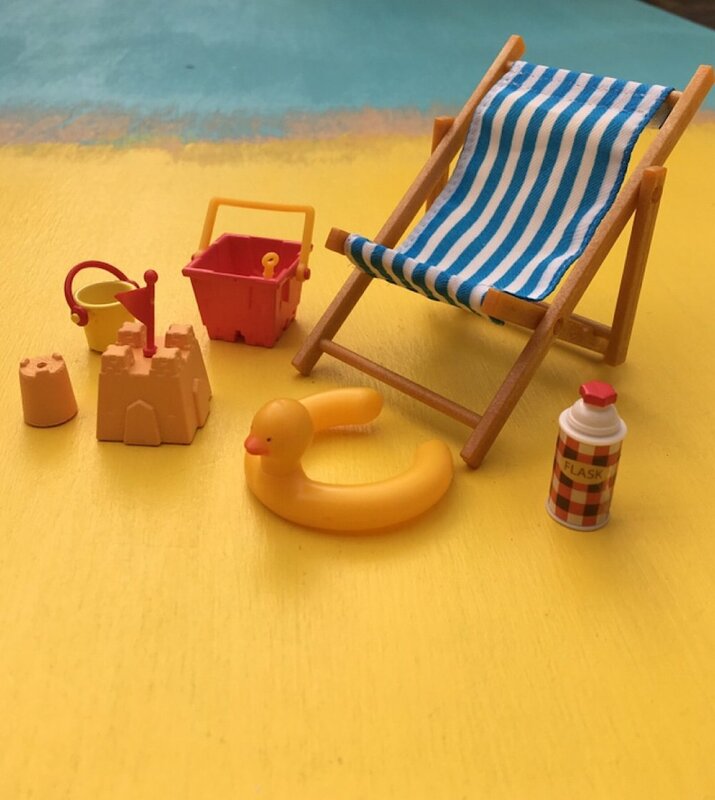 The bucket and spade are the more ‘action’ part of the scene, while the deckchair is lazing in the background. 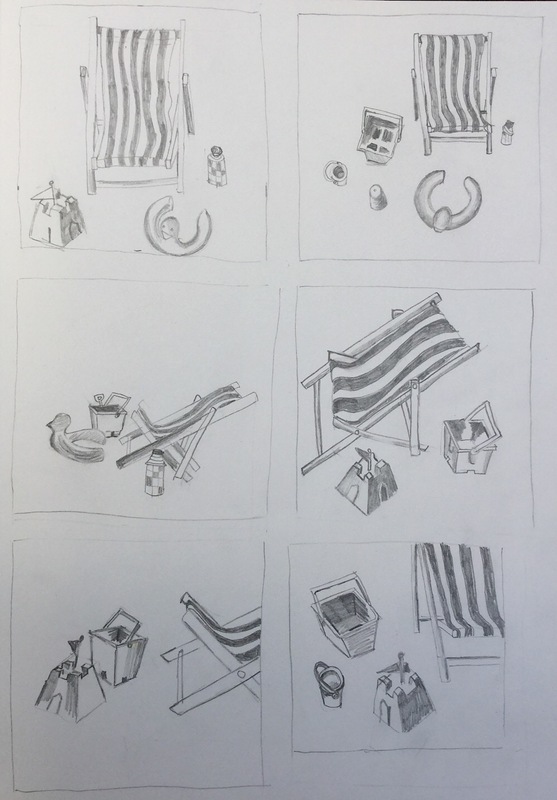 I then repeated the process of exploring viewpoints by drawing thumbnail sketches of my summertime items. I found it difficult to decide which of the viewpoints most conveyed the idea of summertime but eventually chose the one above right. 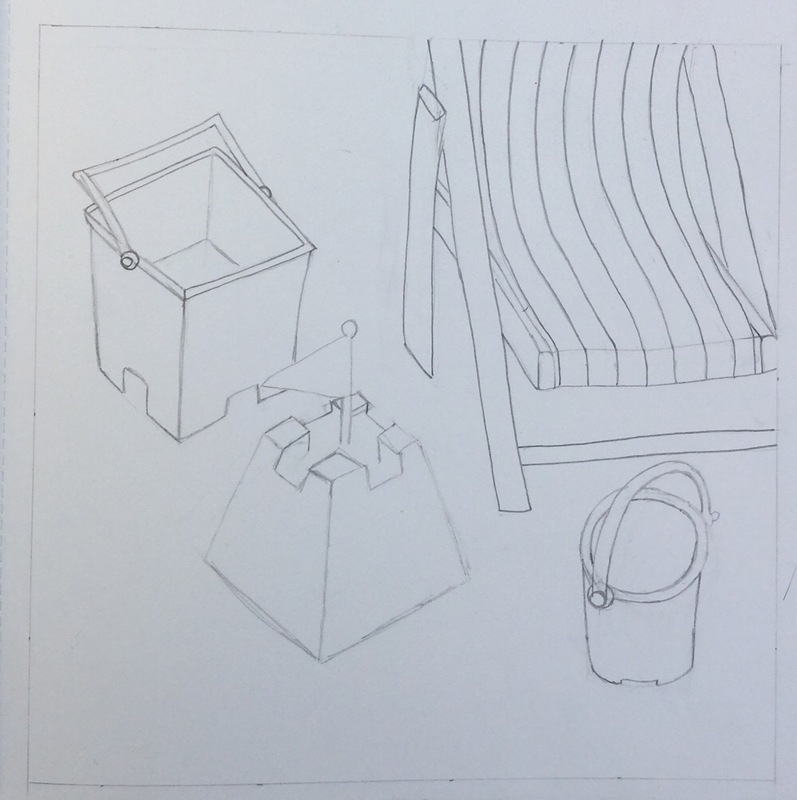 Compositionally, I prefer the viewpoints that crop out part of the deckchair and this thumbnail also has the icons of summer, the bucket and spade, in the foreground with enough of the deckchair visible to be clearly understood. I also think this viewpoint has a narrative. A parent could be relaxing in the deckchair while children make sandcastles at their feet. 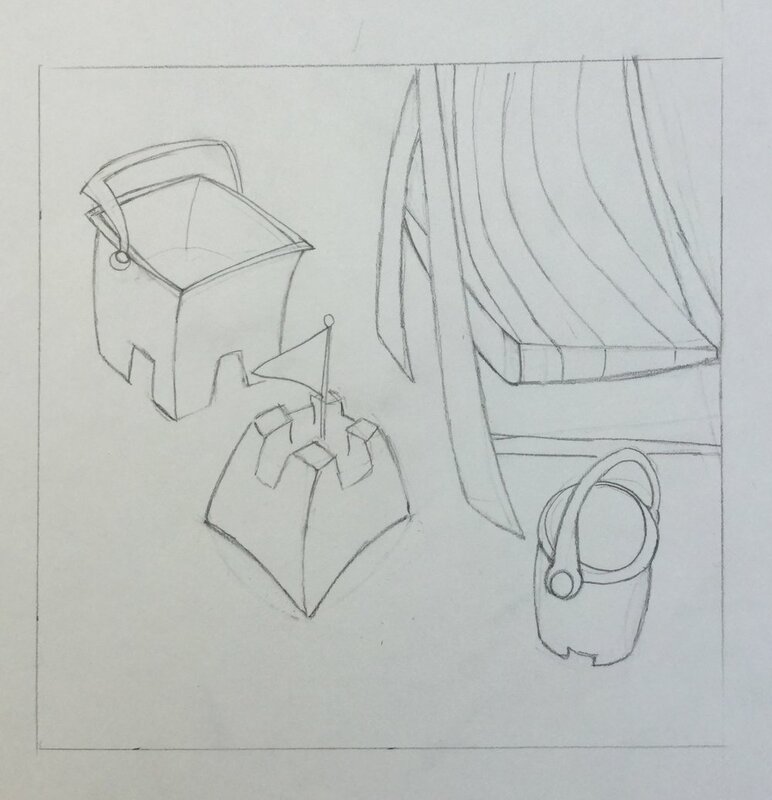 Some of the other sketches just looked like a collection of objects arranged in different ways. I then drew my chosen design in a larger size with the scale proportional to the original thumbnail. The exercise asked for this line drawing to be descriptive, but I wasn’t sure how descriptive it needed to be so I just included enough line to make the elements recognisable without adding any unnecessary detail. I then made a second drawing which was still just the basic outlines but had a little more character in the illustration. I found it easier to deal with the scaling up by drawing the objects more realistically first before creating a second more stylised version. I prefer this second drawing but am still unsure whether I have made it descriptive enough. It could benefit from some sort of background or horizon line. 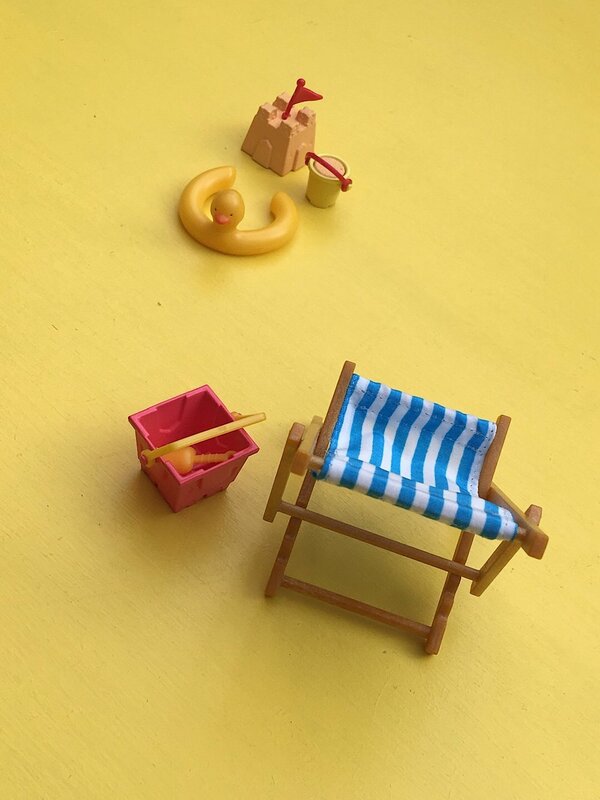 I did think about adding a wavy ‘sea’ line behind the deckchair but decided to keep it focused on the objects. It wasn’t part of the exercise to add colour to my visual but the simplicity of line made it perfect for trying out a more graphic approach to colouring. For a first, very quick attempt, I think it is quite successful for the majority of the design. I don’t think the round bucket works though. This is an area I would like to explore further. 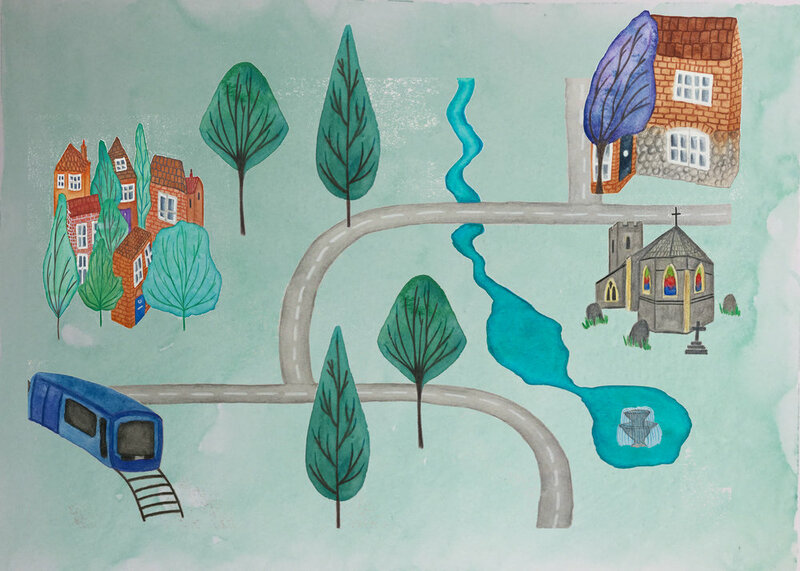 From the three choices given for the diagrammatic exercise I chose to illustrate ‘A map to my house’. I chose this because travel and map illustration is an area I am particularly interested in. Alan Male describes a diagram as “an illustration that depicts the features of an object, a system or a manufactured or organic process by way of an exposition that goes far from pictorial reality. The visual language can comprise graphical or symbolic representation and contextually does not work unless the information or message is clearly elucidated. “ Male. A (2007) . It is important that illustrating diagrams clearly depict what is intended but there is scope for stylisation. The images do not have to be realistically accurate, as long as it is clear what they are intended to represent. With the definition clear in my mind, my next step was to research map illustration. Due to my interest in this area of illustration, I have previously collected reference images of illustrated maps on Pinterest. There are a range of different styles. Some, like Benoit Cesari, (image 1) use mostly text in their maps. Josie Portillo’s illustrations of each feature are very detailed (image 2) while Libby Vanderploeg (image 3) uses more graphic images. 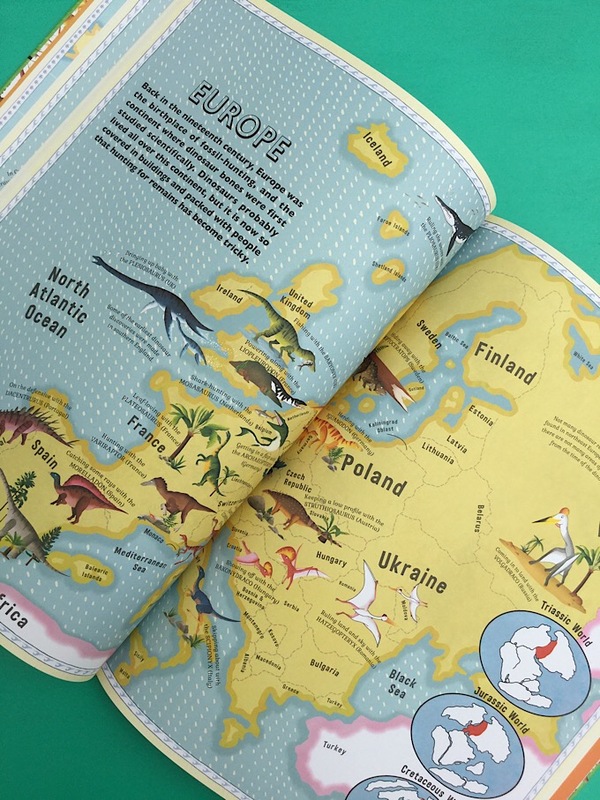 Some maps like image 4 by Lucy Letherland are focused on depicting one particular thing, in this case, dinosaurs. All have a very pleasing aesthetic while also providing the viewer with information about the features that can be found in a place, and where in that place they can be found. 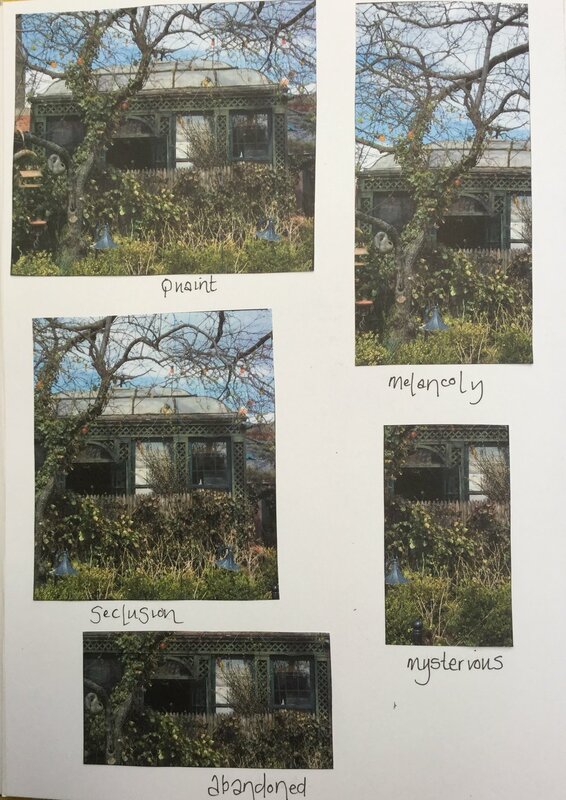 The icons they use to represent the features are a mixture of images of actual landmarks and images of things such as an item of food, to show that that can be found there as shown in image 5 by Livi Gosling. I came across an article in which illustrators were giving tips about illustrating maps. https://www.digitalartsonline.co.uk/features/illustration/30-brilliant-tips-for-creating-illustrated-maps/ . Something a few of the illustrators spoke about was use of colour, particularly choosing a limited palette for clarity. Daniel Gray (image 1) is well renowned for his use of a limited colour palette, both in maps and children’s books. 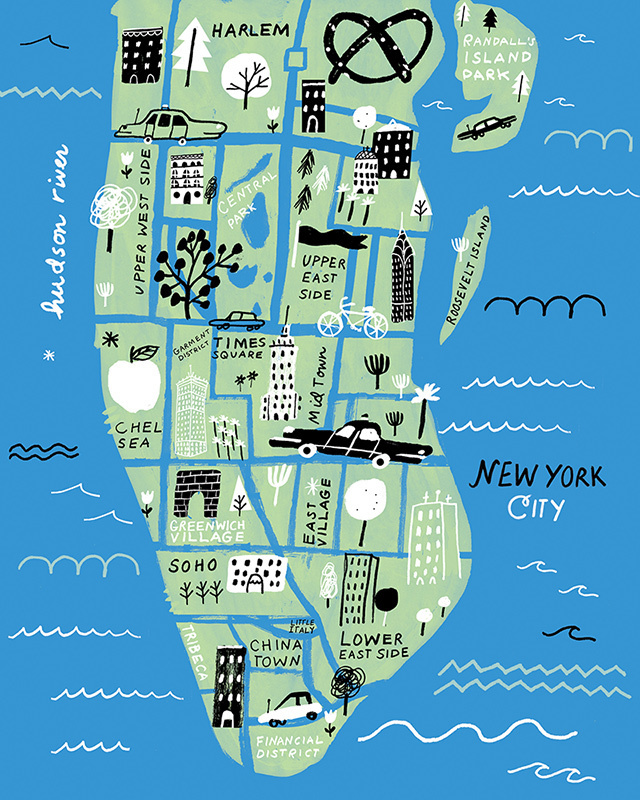 Liz Mosley’s map of Manhattan (image 2) depicts the subject very clearly using a limited palette. For my own map, I started by using google maps to ensure accuracy in my illustration in terms of directions. This helped me decide that the starting point for finding the way to my house should be the train station. I then drew the area between the station and my house. I drew this out a number of times to see which way the map would look most visually appealing. 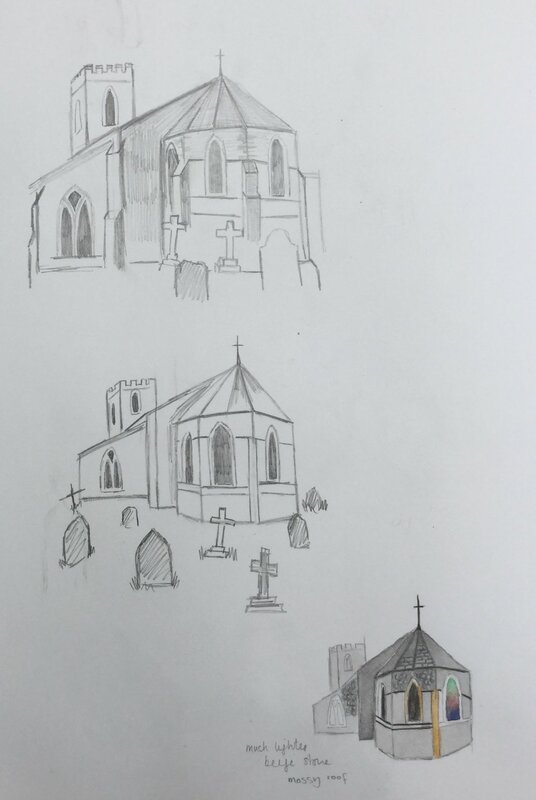 After working out what landmarks I would need to include, I went out and took photos so I could draw from observation before illustrating. I would have drawn outside if it wasn’t so cold! For some of the features, I decided to draw the actual building and for some, an icon to represent it. For example a teapot and cup to represent the tea rooms. In the article previously mentioned, a few illustrators spoke about using colours linked to the place being illustrated. I live in a place called River so I chose a bluish green colour palette as a starting point. Most of the maps I looked at include lettering but the brief said to keep this to an absolute minimum so I decided not to include any on mine. When illustrating from my observational sketches, I tried to simplify the image while still leaving it recognisable. Once I had made roughs of all my icons, I drew out a rough layout for the whole map put together with my intended colour palette at the top. I kept the greenish blue colour palette running through the icons but I did also use brick and stone colours to try to keep the landmarks recognisable. 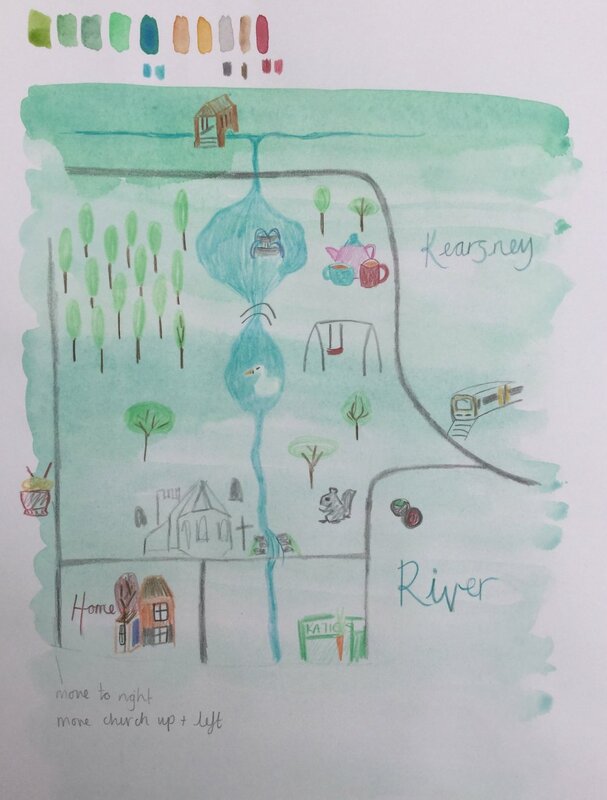 From this I was able to see that I had created a map of River, rather than a map to get to my house. There were lots of features on there which were unnecessary and complicated the directions. 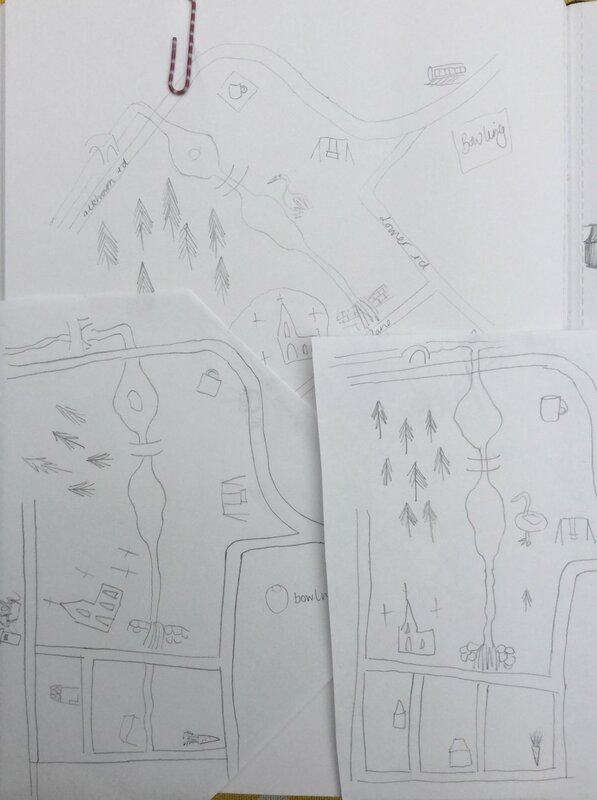 So I drew out more layouts focusing on just the area from the station to my house and reduced the number of features on the map to only include those important for helping someone find the way. The image below shows two layouts. I decided that creating the background, road layout and each icon separately and assembling on photoshop would be the best way of working on this. That way I could continue tinkering with the layout and positioning once I had all parts ready. The first map I made had all the features of a similar size making the map look quite uniform. It was clear and easy to follow, but seemed a little boring. I didn’t really like the roads coming to the edge of the background either. While I haven’t used text, I have included the house number as I thought this was necessary in a map to my house. The other option would have been to draw all the houses in the street and make mine bigger but I think this would have made the map look cluttered and lack clarity. The next two versions were quite similar to each other, the only difference being the size of the trees. In the map on the left I have left more negative space and the road can be seen more clearly. The trees in the one on the right obscure part of the road but do make a barrier over the part not to be followed which I think actually makes the map clearer to follow. I find it more aesthetically pleasing too. However it still didn’t seem quite right and I didn’t want to have to use a house number. I tried out landscape to see how well that worked. This was really interesting because it made the map look almost 3d. The scaling looks weird though because I made the church smaller than the house because it is not such an important part, but it is in the foreground so should be bigger. I wanted to explore this more 3D look further so I made another version with the scaling more ‘correct’. I actually don’t like it as much. The train is too big in the foreground and was not drawn for this layout so is at an odd angle. With the collection of houses big in the foreground, the way to my house is not really clear enough. I decided to go back to the portrait versions but I found this really interesting and is something I would like to explore further later. Creating the landscape version above made me realise that the collection of houses need to be less prominent in order to make the destination of my house more clear. So in my final version, I made that icon small and put trees in front of it. Aesthetically, I do think text would look nice, but it isn’t actually needed because I think this clearly shows the way to my house without having to use the house number. I think I mostly kept my illustration style consistent. If I was to do this again though, I would add flint texture to the church to make that more synonymous. I also wouldn’t use the sandy colour on it. It was on my original colour palette, but I don’t think it works in the actual piece. I would keep the stained glass windows to blue and green too. I would also change the train icon. Although it is blue, the darker shade doesn’t work well with the rest of the palette. I really enjoyed this exercise. I have learnt a lot about position and layout, careful colour palette and consistent illustration style and am even more interested in this area of illustration for the future. The photo I chose on which to base my work for this exercise was taken in New York. It is of a tiny park hidden in the area under Brooklyn bridge. I chose it because it has a range of content; Manhattan bridge in the background; Brooklyn bridge over the top; the summer house building that sits just in front and below; the garden and trees in front of that. The left side of the photo contains different content to the right side. The task was to make edited versions of this image using a viewfinder, to crop in different ways in different formats. The compositions this activity gave me fell into groups. The first group, shown below, kept the summerhouse as the main focus. With some of the background cropped out, the image could have been taken in a back garden. This is especially so in the image in which the bridge is cropped out and the shed and birdhouses left in. In the next set, I cropped out even more of the surroundings. Removing this and part of the summerhouse gives it a mysterious quality, because the areas like the path that suggest a public place are no longer there, leaving the summer house looking abandoned. With the spring daffodils also taken out, the winter vegetation makes it look almost overgrown and untended. There is a lot more drama and narrative around these images. Below are a set of images cropped to focus on the Manhattan bridge. Framing it so it is centre but just visible through the trees shown in ‘majestic’ makes an interesting composition. In ‘elevated’ I cropped the top lower which made the bridge appear elevated, hence the name. ‘Bare’ is the tree from ‘tangled’ turned round to appear upright. This set of images looks totally different to the others as the subject has changed from the summerhouse to the bridge and trees. The final set of images focused on the shed. Again, the content in these is different to the others. It feels like it has been taken in a different season with the spring flowers contrasting with the bare wintry branches in the images above. These images also suggest the presence of people tending the area more than in the rest of the original image. The shed, pots and bird houses could be in anyone’s back garden. I then chose words that reflect the feeling the content of the cropped images gave me. This was easier for some than for others so I made a mind map and asked someone to add to my ideas. Mine are in black with his in green. 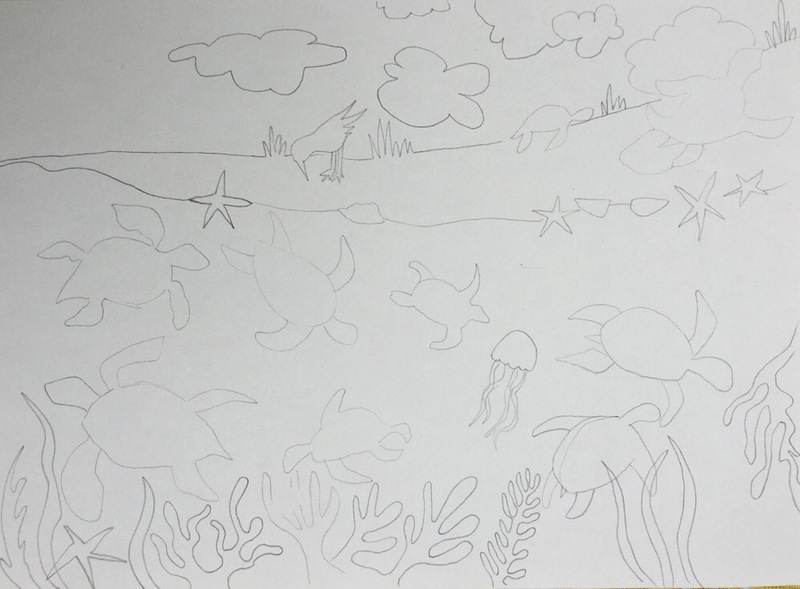 The next part of this exercise was to choose one of the compositions to make an illustration of that could be used to make a poster. I started by making a sketch of one of the images from each set. The sketches were made of: Intriguing, sweet, elevated, quaint. These are shown below in that order. When there, the place had a feeling of seclusion about it; it was a small haven in a large city. So that was the angle I wanted to take my illustration. Therefore having the Manhattan bridge in the background was important to indicate the city ‘outside’ the secluded haven. 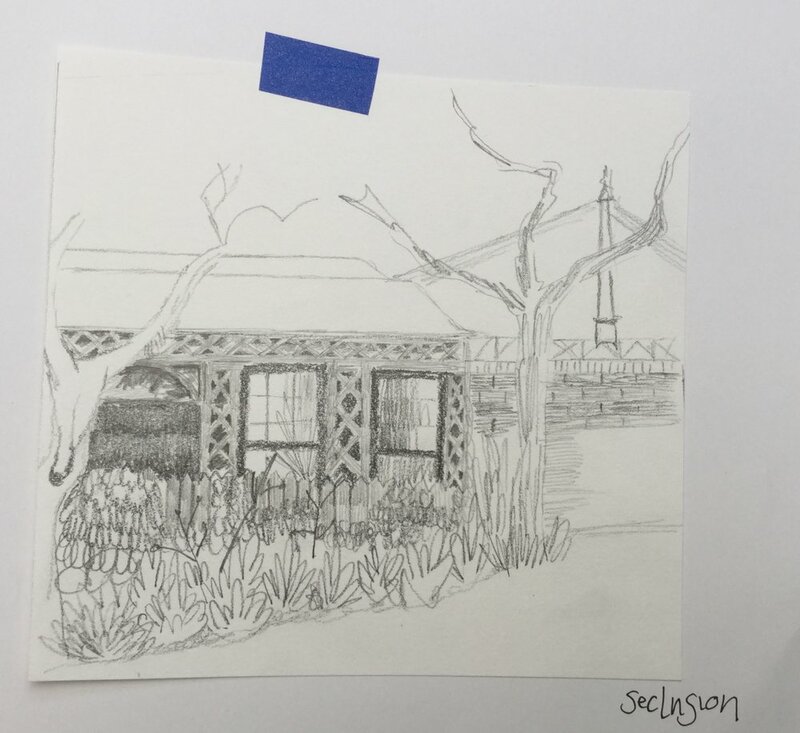 To include both the majority of the summer house and the bridge would make the illustration landscape. The photo is landscape. But posters are usually portrait. So I needed to problem solve and started to play about further with the composition, moving the bridge closer to the summer house to try and make it more portrait. I also brought the tree on the right in closer thinking this helped create more of a sense of seclusion. The first sketch still wasn’t portrait enough so I drew out further versions and added the area for the text to be placed. One contained more foreground to elongate it and featured the text vertically along the right side. The other places the text at the bottom, serving to elongate the illustration. I still wasn’t happy with these though and looking back at my cropped images and their sketches, the one titled ‘intriguing’ caught my eye. It is portrait in layout and suits its title really well because the way it is cropped adds to the intriguing feeling. The viewer is led to wonder what the surroundings are, what is on each side. It arouses curiosity. 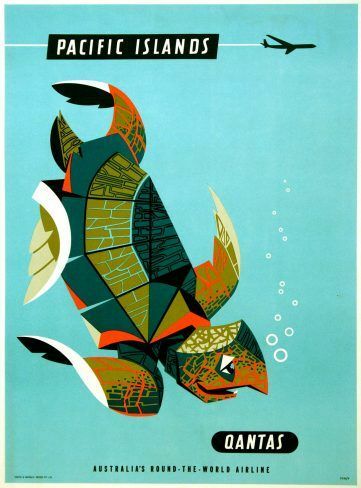 Having made a collection of posters on Pinterest to reference, it is clear the most effective ones are graphic in style. 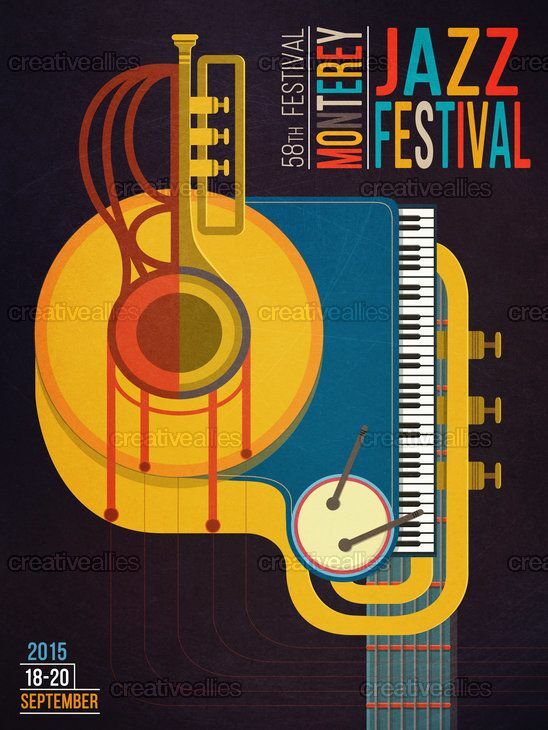 This type of illustration lends itself well to creating eye catching visuals. Below are some I am particularly drawn to. I am looking to experiment more with graphic illustration during this unit but was quite unsure how it would work with the image I had. There is a lot of detail in the image that I couldn’t see working in large graphic shapes. Then I found the poster below, by Carson Ellis, one of my favourite illustrators. The design for this poster is much more detailed than the others. Although quite intricate, it still uses bold lines and contrast to make it eye catching. My next step then was to try to make my image more graphic. I focused on the dark and light lines and made them bolder. I zoomed in on the original photo to draw ivy from observation before drawing my own simplified, more graphic version. While attempting a more graphic style, I also needed to keep my chosen word in mind. Intriguing. The colouring in the original photo is mainly green and brown with a blue sky. To add intrigue, I decided to use a purple colour palette in addition to green and brown. This would also make it more eye catching. I chose a watercolour wash for the background because the translucent nature of it suggests intrigue. In contrast to this, I used gouache to illustrate the body of the summer house because I wanted a more graphic feel with bolder flatter colour. I find gouache difficult to work with but it is a medium I want to make more use of and intend to practise. The door, roof and windows are again in watercolour to create intrigue about what is inside. The think the colour palette works well in communicating the word intrigue. The detailed nature of the illustration meant that I found it quite difficult in terms of layers. I found I was filling in fence colour through the foreground foliage I had already put in. A learning point from this is that next time, I will either plan and mask the the layers more effectively or complete each separately and put together in photoshop. I adjusted the colour and tones slightly in photoshop next. Below are the results. The top is the original artwork. In the second, I added highlights which made the colour pop more. In the third, I adjusted the brightness and contrast. I don’t like this effect, I looks too dark and foreboding, not intriguing. The bottom one had its hue changed. I like this one, it certainly looks intriguing! Now I had the completed artwork, I needed to add the text to make it into a poster using Indesign. In all of the examples below, I added the text horizontally at the bottom of the image. It seemed to make most sense in that position. I tried out a few different fonts. Firstly I tried Sans serif fonts because they are bold and easily readable. However they didn’t say intriguing so I went for a script instead. I used kerning to add space between the letters and make it more readable. I also tried placing the text in a different position but I don’t think it has the same impact. To make the text vertical I had to type on a text path and I can’t work out how to remove the line. Something to work on! My final chosen poster is below. It uses the image with highlights added to make the colours more vibrant. I think that the poster does reflect the word ‘intriguing’. The purpose of a poster is usually to tell people about something, to coax them to attend or use something, and I think mine definitely arouses that curiosity, makes them want to find out more. It didn’t end up being particularly graphic in style, but I think the textures I used emphasise the word intrigue and the feeling I wanted to create. I will continue to explore graphic design and experiment with a more graphic style in the rest of this unit. The focus for this exercise was to ‘read’ the image by Mark Oliver below. The majority of the image is taken up by a huge red sleeping dragon who appears to be guarding treasure. He has his whole body wrapped around jewels and other golden objects. There also appears to be a throne perched on the top of the treasure, possibly for his master or mistress to sit in. Perhaps he is a dragon owned by a king or queen, there to protect them and their possessions. On the left side are two children, one of them carrying a torch of fire which provides the other ‘hot’ part of the image. The whole scene appears to be set in a cave with the torch providing light. On either side of the children are piles of armour and weapons, including shields, swords and daggers. These could belong to the children, or they could be a collection, trophies from all the other warriors who have come to try to defeat the dragon. My initial thought for the story was that the children were trying to steal the treasure, however the poses of the children suggest a few other possibilities. They appear to be attempting to wake and lure the dragon away. The girl looks like she is addressing the dragon, while the boy is pointing at the way out. This may be the reason for the children putting down their weapons and armour because they want to appear friendly. Another possibility is that they have stumbled across the dragon by accident, the boy is scared and pointing behind them to suggest they go back the way they came. The positioning of the girl’s hand doesn’t fit this idea though. This image is from the book ‘Tom’s Clockwork Dragon’ written by Johnathon Emmett and illustrated by Mark Oliver. I am aware of the book but haven’t read it. The colours used in the image are bold and bright. the eye is immediately drawn to the bright red of the dragon, then round to the torchlight. Hot colours such as red, orange and gold are used in both these areas. The dragon is main subject of the narrative and the use of hot bold colour ensures this is conveyed in the image. The cooler areas in blues, purples and dusky greens appear secondary to the heat of the dragon and the torch. Only after the eye has seen these hot areas does it search and explore the rest of the image. The torch creates shadows in the cave which are darker in hue. I was particularly drawn to the purple used on for the shadow on the right side of the dragon. Although it is shadow and darker, it is still a warmish colour. The use of purple around the dragon and cooler blues around the children further develops the hierarchy establishing as the visually dominant subject. The cooler areas of the image background are more textural and detailed, for example, the floor around the children is more detailed than the shadowy floor behind the dragon. This is because detail is more evident where there is more light. This exercise was intended to be done with images printed out, photocopied at different sizes then arranged to form different compositions, but due to lack of printer ink I decided to use Adobe illustrator to make my designs. Working on the computer worked really well allowing me to manipulate the subjects however I wished. It also allowed me to look at all my compositions together so I could make comparisons. 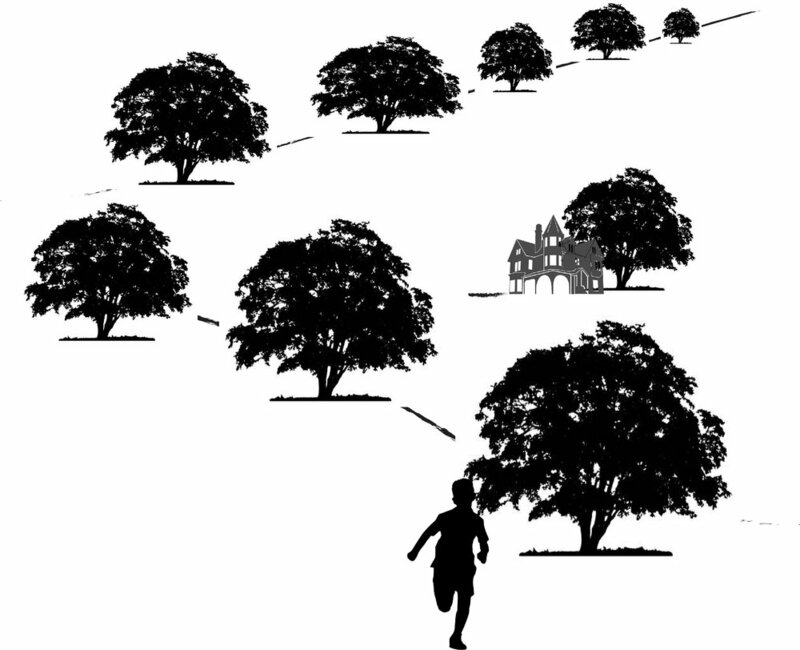 A tree, building and child running were the required subjects for my designs and the images I used were silhouettes, chosen for their simplicity. I didn’t want colour and detail to detract from the focus for the exercise. I started off simply, by creating a horizontal design with each element in relative scale to each other. 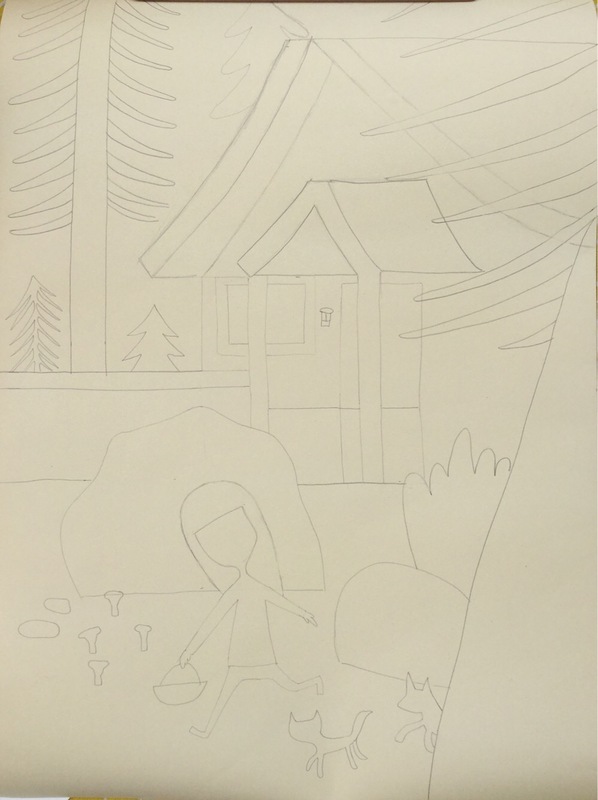 The house is slightly in the foreground placed in front of the tree with the child slightly behind running forward. The elements placed horizontally like this creates a ‘normal’ looking scene with a child running around his home. Next I placed each element vertically with trees creating a horizon and the house in front of them. Making the child large and placing him in front of the house suggests that he is running away scared from something in the house (it does look a bit haunted!). Positioning the subjects in this way creates an eerie, dramatic feel as the viewers eye is led through the image wondering what has happened to make the boy run away. I experimented with this effect by trying out the tree in front of the house. It didn’t make sense with the tree directly in front of the house so I moved it slightly to the left and added a horizon ‘hillside’ line. Although the objects are still essentially positioned vertically, the diagonal hillside gives it distance and space. The viewer’s eye is drawn diagonally from the left corner up the hill then back to the boy. This, together with the smaller house means this composition doesn’t look as menacing as the previous one. Similarly, the design below uses a hillside horizon and diagonal positioning to create distance. The small house makes it looks less threatening making the boy appear to be leisurely running down the hillside. In the design below I used more trees gradually reducing in size to create distance and perspective. The eye is drawn from the boy up through the trees to the spooky house. This does create an eerie feel. Next I created a more playful design. By rotating the boy and positioning him over the tree I was able to make it look like he is swinging upside down. By cropping part of the house and placing the tree slightly in the foreground I have created a happy scene in which a boy is playing in his garden. Adding a horizon line would stop the house from looking like it is floating. In my final design I put all objects at non vertical or horizontal angles. This created a sense of chaos because nothing is grounded. It looks like everything has been whisked up in a tornado! Looking at the images next to each other enabled me to make comparisons and choose which composition I think is most successful. The biggest learning point for me during this exercise is how composition directly affects the narrative in the image. Consequently, choosing the most successful image depends on the story I am telling. To tell a story about a boy running from a haunted house, I think the design fifth from the right is most successful. I like the perspective and sense of distance created by the trees together with the drama created by the large figure positioned in the foreground. If I was telling a story of a carefree child running around happily, I would choose the design on the left. I love the diagonal positioning and the distance it creates.